I wasn’t completely ready for it to be Christmas this year, to be honest. I feel as though the past year just whizzed by, and wasn’t it just Christmas 2014? But then the last week of November rolled around, and I started to feel the tingle of anticipation creeping up on me. Last weekend we decorated my flat, and I bought a ridiculous amount of fairy lights. So my Christmas excitement is once more alive and well, and I’m not even going to apologise for the explosion of snowflakes, Christmas trees, candy cane hearts, and snow men on this page. The fairy lights are up and the baking has begun. Although I’m generally very much against fussy recipes, for some reason most of the Christmas cookie recipes I grew up with, and HAVE to make each year because I love them, are all a bit finicky. 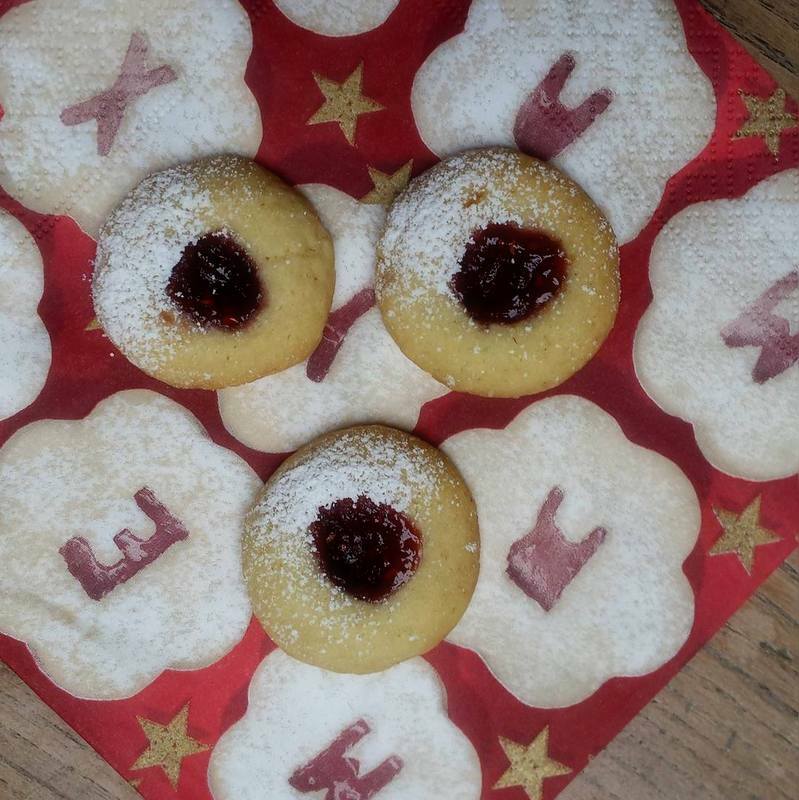 But a few weeks back I stumbled across the easiest, and no less delicious for it, Christmas cookie recipe. It’s even versatile. It’s most definitely going to be part of the annual Christmas cookie baking bonanza, and I may or may not have eaten a few dozen of them already. 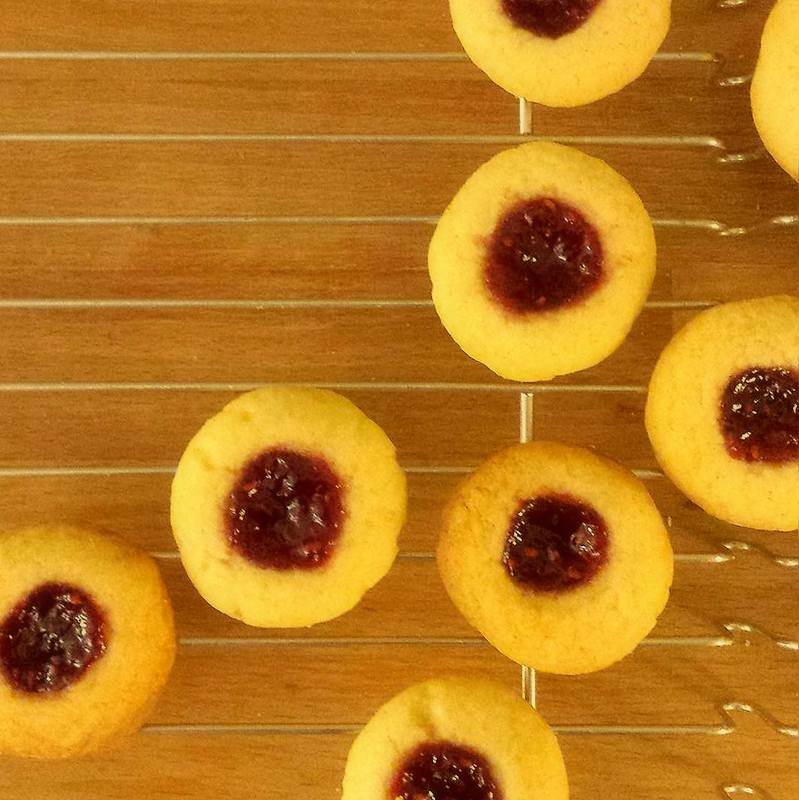 These super moorish little thumbprint cookies are kind of like a shortbread cookie, but a little lighter (because of the baking soda), tender and crunchy at the same time, with a lovely little jammy centre 🙂 I used raspberry jam, and it was perfect, these cookies definitely need a slightly sour, or tart, sort of jam I think. I’m also going to try apricot, and maybe also some lemon curd. I think these would be killer with homemade lemon curd. The first time I made this cookie dough I only made the thumbprint cookies, but the texture of the cookie made me think the dough would also be perfect for Danish jødekager (‘jødekager’, which translates as Jewish cakes, purportedly got their name because they resembled a type of cookie/biscuit that was traditionally sold in Jewish bakeries and shops in Copenhagen a few hundred years back), a crispy little cookie with cinnamon sugar and chopped almonds on top. I make these every year, each time using a different recipe because I can never find one I’m completely satisfied with. Until now, that is 🙂 I made some last year that I thought were perfectly lovely, but these are so much better, and so much quicker to make since there’s no faffing about with rolling pins and cookie cutters (even if I LOVE my cookie cutters – and my friend recently gave me a dinosaur-shaped one that I have yet to use!). I brought them to the office glühwein (or ‘gløgg’, in Danish) party this Thursday, and they all disappeared even though the table was almost completely covered in Christmas goodies, and I ended up taking about half of the thumbprint cookies back home with me (not a problem, they have now vanished). 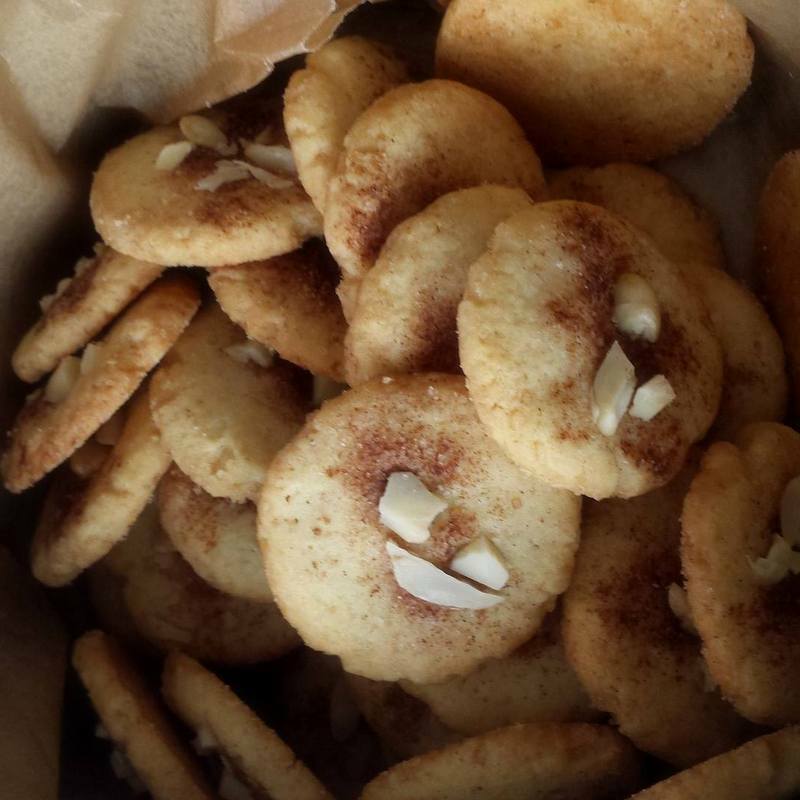 I think these would also make for really lovely snickerdoodles, were they to be rolled entirely in cinnamon sugar, and flattened slightly less than you would to make the jødekage-variation. 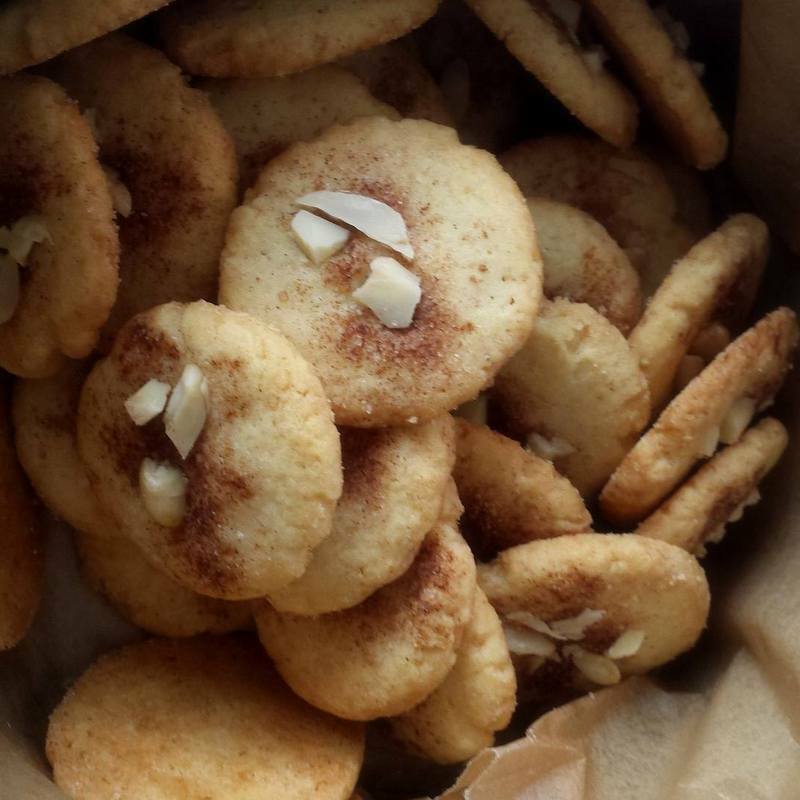 To make the jødekager, follow the instructions beneath the thumbrint cookie recipe. To make both, use half of the dough for the thumbprint cookies, and half for the jødekager (or however you want to split it, should you want to make both variations). In a large bowl, beat butter and sugar together on medium until nice and fluffy. Add the egg and vanilla extract, beating for another minute or so. In a small bowl, whisk together the flour, salt and baking soda (I don’t always have the patience for sifting, and whisking the ingredients together with a hand whisk usually means it’s ok to skip this step). Add the dry ingredients to the wet, mixing with a silicone spatula until everything is just combined. I use my hands to press it together at the end. Ideally, cover the dough and let it sit in the fridge for at least 30 minutes. I didn’t do this for the first batch though, and they were fine. Roll little 1½ cm / ½-inch balls of dough between your hands, and distribute evenly on a non-stick baking tray, leaving at least a few cm between the cookies. Don’t make them too big, as they will expand slightly, and the bigger they are, the more they’ll spread out. You want it somewhere around the size of an unshelled hazelnut, if that makes sense! The original recipe calls for them to be a little bit bigger, about twice the size of mine, but I prefer them smaller, as I find that the bigger ones expand too much and make for a less satisfying cookie-to-jam ratio. 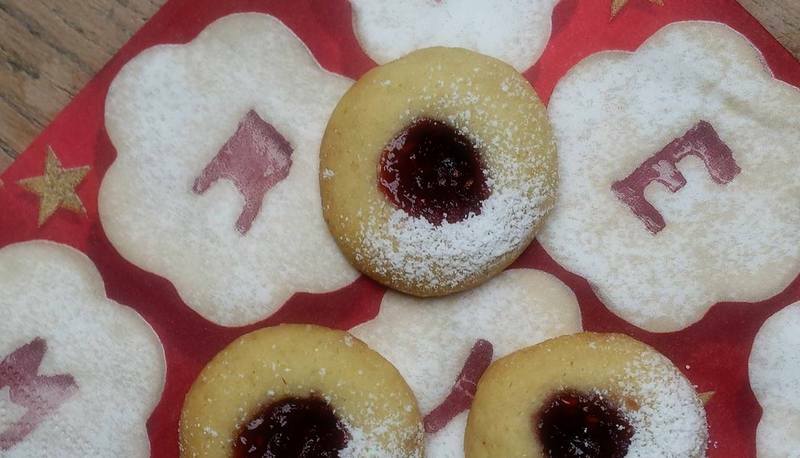 Press a nice, deep indentation into each cookie – I find it easiest to use my pinkie or ring finger, holding the cookie steady between the thumb and index fingers with one hand, and pressing down into the cookie with the pinkie finger of the other hand, giving it a little wiggle to gently expand the hole. 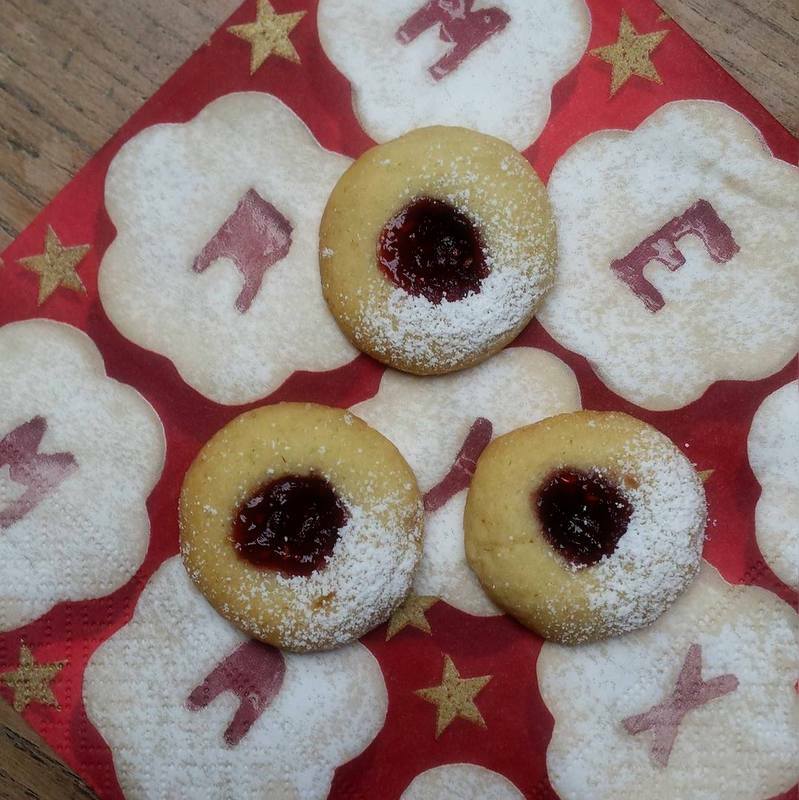 Scoop about 1/4 tsp of jam into each ‘thumbprint’, just enough so that it peaks out from the indentation. Bake for about 10 minutes at 175°C/350°F, taking them out when the edges begin to brown a bit. Let cool on the baking sheet for about 5-10 minutes, then transfer to a wire rack to cool completely. 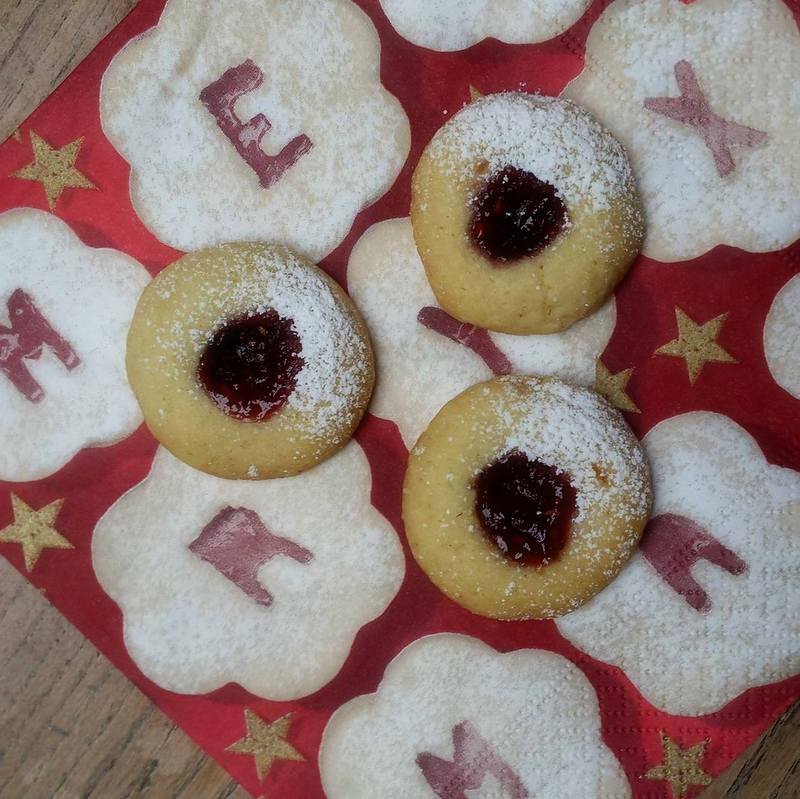 While one baking sheet is cooling, roll more little cookies out, place them onto a second baking sheet, make the thumbprint/fill with jam, and bake. Repeat this rotation about 4-5 times, until you run out of dough, each time letting the baking sheet cool before you place the fresh batch of unbaked cookies on it. Dust lightly with icing sugar, if desired 🙂 keep the cookies in a cookie tin, separated by layers of baking parchment. Blanch the almonds: pour boiling water over them in a small bowl, cover them, and leave them for about 10 minutes, whilst the skins loosen. Then pour out the hot water, and squeeze the almonds out of their skins. Chop chop chop them up roughly. Shape the cookie dough into little balls, about the size of an unshelled hazelnut/1-1½ cm in diameter. Place them on an ungreased, non-slip cookie sheet. Press the cookies flat with the ball of your hand, so they’re about 2-3 mm thick. 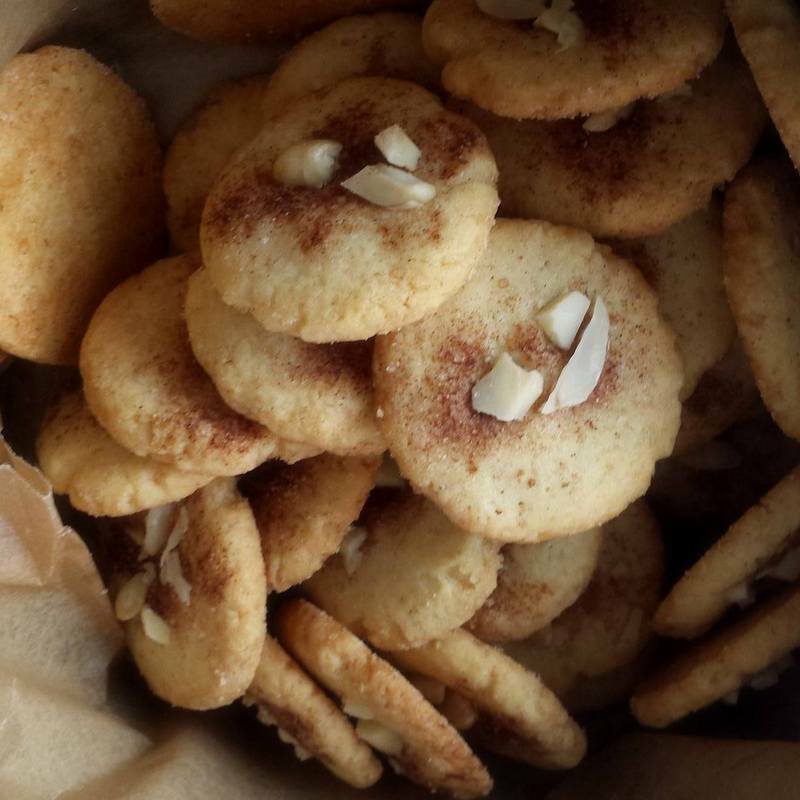 Sprinkle cinnamon sugar on top in a sort of stripe through the middle, then press a few bits of almond on top. Bake for about 9 minutes 175°C/350°F, until they only just begin to brown around the edges. Let cool for a few minutes on the baking sheet, then transfer to a wire rack to cool. 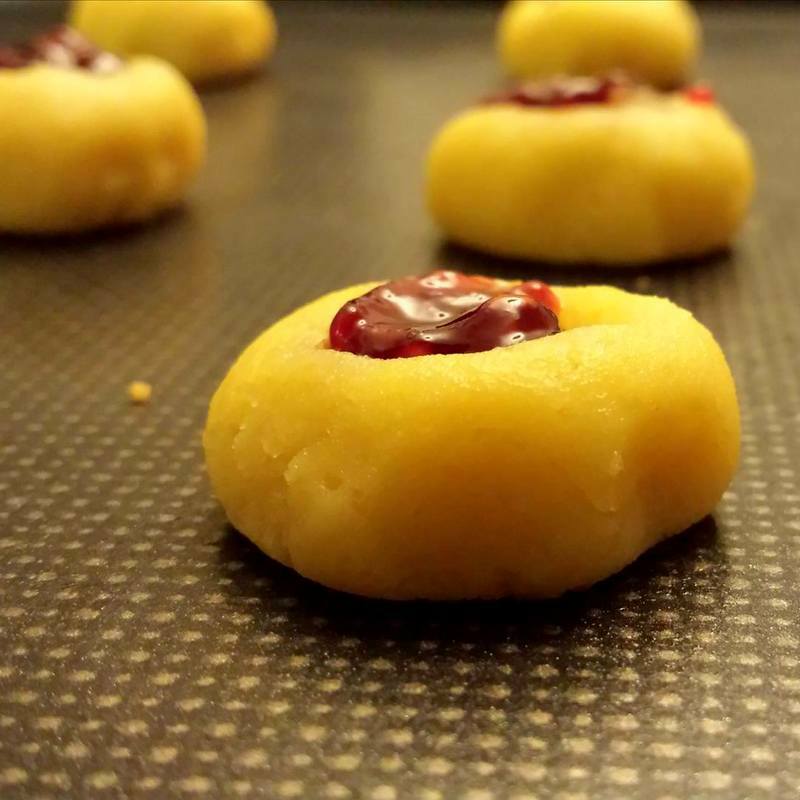 The thumbprint cookies keep for a bit more than a week, but are best the first two days, after which they tend to get a bit stale and the jam loses it’s glossy sparkle. I’m thinking I may try to make them thinner, and coat the thumbprint in egg wash next time, this might allow for the cookies to keep for a bit longer without going stale (the thickness of the cookie, along with the moistness of the jam means that the cookie loses it’s ‘crunch’ after a few days). FYI – this dough is actually best used at room temperature, or it ‘cracks’ around the edges when you smush it down. If your dough is fridge-cold and you don’t have time to let it sit, I would roll it out into a log, and cut it as finely as possible, with a sharp, thin knife (for the jødekager, that is, for the thumbprint cookies it’s not a huge problem as you don’t need to flatten them quite as much). The dough will keep in the fridge for several days, but is easiest to work with on the day it’s made (and since it’s so quick to make, this isn’t really an issue, in my mind 🙂 ). I’m also thinking of making these with nutella or something similar. Or maybe a dark chocolate variety, although they’d lack the chewiness of the jam, once cooked. Ooh, and I also think a tart cherry jam would be really lovely with these!